Is this guy really indicative of what Standard is like? That's an awful lot of keywords in the same place at the same time. I suppose you need as many as you can when you're going up against Nicol Bolas, but he'd be pretty playable if all he had was the Fires of Yavimaya effect, much less all the others. He's obviously intended to be the main event in some sort of Standard midrange deck with those colors, and I have no doubt that will come to pass; just be careful in Commander, as that one activated ability makes him a Naya creature rather than Gruul. Samut is one of those creatures who feels really, really powerful. More powerful than she looks at first. A fitting start to Amonkhet reviews, I suppose. For starters, her stat line is pretty respectable, effectively a 6/4 for 5 mana. This is before we get into her litany of abilities: haste, vigilance, double strike (why she’s effectively a 6/4), and flash. Her ability to untap another creature requires a third color to go into, but it synergizes will with red and green’s preponderance of exert. She hits hard, she blocks well, and she synergizes with your team. Five mana is actually about right for her; more makes her too underwhelming for the cost, while less makes her out-and-out broken. 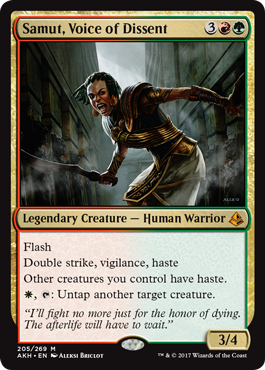 She may actually make a good Naya-colored commander in EDH, for those so inclined to try her. I don't think there’s one thing Samut does specifically well, but she does a lot well to where the whole is greater than the sum of the parts. I would not be shocked to see her tear up standard.